The Christmas season in Seattle is… basically any day that isn't overcast between now and, like, April. But it's also an actual holiday that, along with New Year's Eve, inspires a wide array of holiday events ranging from boozy pop-up bars to dance parties and everything in between. This holiday season the tiny subterranean cabaret in Pike Place Market is putting on a "carnival of merriment (that) glitters with the cheer of yesteryear"… only their twice nightly shows aren't actually like any Christmas you remember. Mostly because they involve scantily clad burlesque dancers. Cost: $40-$50 gets you in but it's more for VIP seating and dinner. Seattle's unique Christmas Ship Festival (it's even trademarked) features a boat full of carolers sailing to a total of about 65 different Puget Sound communities over the course of a month and entertaining people gathered on shore. Cost: Tickets start at $38 but it's free if you watch from shore. Since 1985 the TheatreSports crew has been performing its own take on Dickens’ classic which starts with Ebenezer Scrooge… and then pretty much lets the audience fill in all the hilarious details. There are a ton of shows, so you have no excuse to miss this one. For the 3rd straight year, one of Seattle's best cocktail bars is performing a Miracle on 2nd and transforming itself into an extravagant, Christmas-themed bar the month before the big day. The cocktails will be tacky (but seasonally appropriate). Glassware (Santa mugs, etc.) and the drinks will have pop culture-inspired names like Yippie Ki Yay Mother F****r. But underneath it all, this is still the Rob Roy, so everything will be damn good. Cost: Pretty spendy for cocktails, but you've gotta get something nice for yourself, right? While we still miss the iconic Maurice Sendak-designed sets used by the PNB for 32 years, their performance of George Balanchine’s classic version (with sets/costumes by the guy behind beloved children's book Olivia the Pig) offers all the holiday magic you need to make date night -- or an evening with the family -- special. Cost: Tickets start at $31, which leaves plenty for post-performance cocktails in Seattle's 6th best drinking 'hood. The Washington Brewers Guild is filling the old Naval Air Station’s Building 30 with dark malty stouts, robust winter warmers, and barrel-aged beers from over 50 local brewers (including some of the best in the state, like Fremont and Black Raven), and offering bites from an assortment of notable food trucks. Celebrate Christmas in Bavaria. Sort of. This picturesque faux German village is the perfect place to enjoy seasonal lights twinkling on snow, roasted chestnuts, sleigh rides, and caroling during the town's annual Christmas Lighting celebration each of the first three weekends of December. Cost: You've just gotta buy enough gas to drive 117 miles there and back. Seattle's largest indie craft show, Urban Craft Uprising, is back with gift ideas from over 150 crafters, artists, and designers selling so much stuff you shouldn't have to shop anywhere else. But if you need to, UCU also has a winter market in South Lake Union a week later. Cost: Free. Through a $1 donation is encouraged. Go to an Eggnog-Off. Yes, you read that right. Every year, Cap Hill's Sun Liquor and Ballard's Brimmer & Heeltap make limited batches of boozy, badass eggnog and this year they're going head to head for Seattle's best nog. All you have to do is show up, sit around the blazing fire pit and try 'em both -- while also stuffing your face with delicious 'smores. Cost: Free to get in. Not-free to drink. The first ever Winter Solstice Night Market from the Mobile Food Rodeo crew is bringing over 100 local food trucks, street food, and other vendors to one giant space, all for your eating/holiday shopping convenience. Cost: Free… until you see/smell something you want to buy. 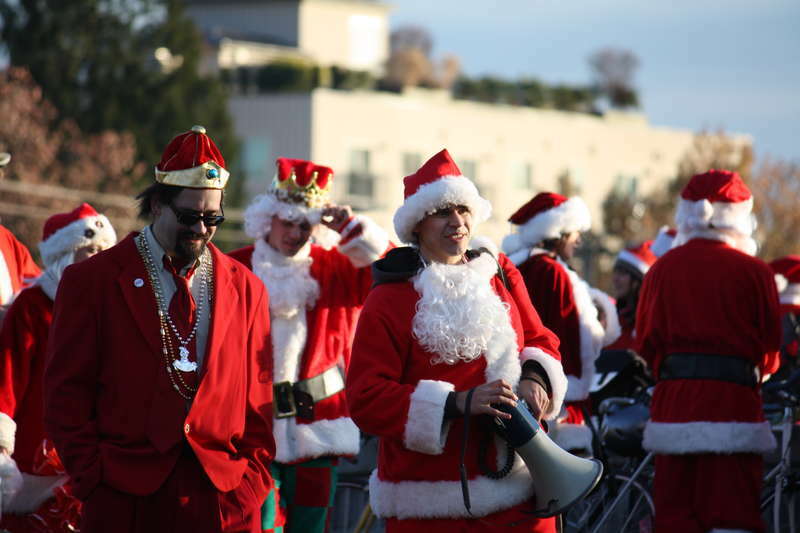 SantaCon is an annual pub crawl where hundreds of red costumed revelers take to the streets of cities around the world. In Seattle, expect to hit a string of Downtown bars, and to takeover Pike Place market for a massive group selfie. Cost: $5-$20. That gets you in all the bars and access to drink specials, etc. but obviously doesn't include any actual drinks. Sure, nearby MoPOP is hosting what might be Seattle's biggest New Year's Eve bash, and it doesn't cost anything to wander around Seattle Center and watch the fireworks, but for our money (see how much below) the Science Center's party under its famed arches, with DJs from KEXP, access to the exhibits you loved as a kid, and more, is the way to start your 2018. Cost: $125 gets you in. VIP is more than twice as much but includes an open bar. Have an EDM new year! The lineup hasn't been announced yet, but Seattle's Resolution Festival is promising to turn the massive WaMu Theater into "a shining world of glitz, gears, and gold". Oh, and multiple stages of seriously good DJs. Bradley Foster is a former Thrillist editor who'd love to buy you a drink during SantaCon. He'll be the guy in red!